This report reviews both the quantitative and qualitative ways in which The University of Scranton makes a positive economic and community impact on the City of Scranton and Northeastern Pennsylvania. -Most numbers, unless otherwise noted, are based on the 2017-2018 fiscal year ending May 31, 2018. Each year, the University offers more than 100 free events to the public. The University created nearly $319.6 million in overall economic output and supported 1,953 jobs according to data from an Institute for Public Policy and Economic Development impact study completed in 2018. On average, each student spends $36 per month dining out downtown. 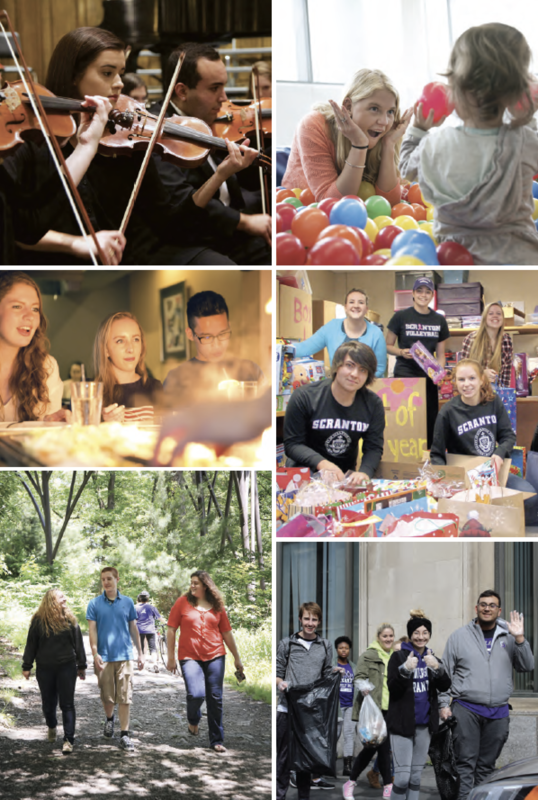 Community organizations held more than 8,013 events at the University since 2004. The University voluntarily contributed $200,000 to the City of Scranton in 2017, $150,000 of which targets economic development in downtown Scranton through Scranton Tomorrow and $50,000 supporting public safety efforts. The University has invested in more than 34 major construction projects since 1980. The Scranton Small Business Development Center provided 908 consulting hours to 139 clients in the City of Scranton in 2017 with a total of more than 12,000 hours in the past 38 years. 2,113 students from the J.A. Panuska College of Professional Students completed 28,693 service hours in the 2017-2018 academic year, most of which took place in Northeastern Pennsylvania. Student, physician and nurse volunteers in the Leahy Clinic provide free healthcare services to Lackawanna County’s uninsured residents — 1,023 patients in 2017. The University awarded more than $70 million in student aid in 2017-2018.